Twelve DAB radio stations have today, 29th February 2016, launched as part of a new, national commercial radio bundle serving large population centres within the UK. 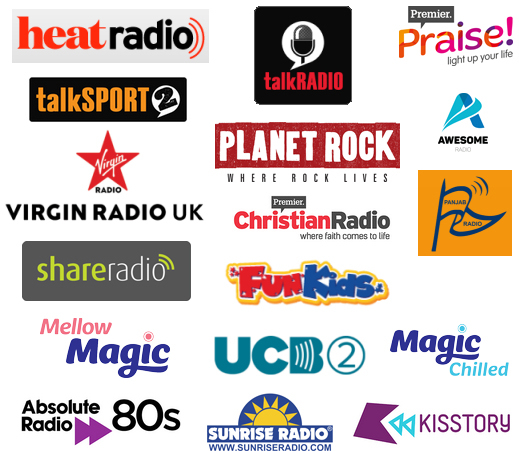 Jazz FM stereo, Fun Kids children's radio, Share Radio, Absolute Radio 80s, heat Radio, Kisstory, UCB2, Panjab Radio 1, Sunrise Radio, Premier Christian Radio and Awesome Radio have all taken their place on the new DAB multiplex, which has its official launch this morning. Planet Rock transfers from its current home on D1 national to its new DAB home from today, 29th February 2016, with the station's label at its previous home displaying as zPlanetRock to encourage listeners to look for Planet Rock at its new home. Digital radios are displaying Absolute 80s old and Absolute 80s new to help with the transition between the station's previous home and its new one, which is due to officially launch at its new home soon. talkSPORT 2, the brand extension to national sports station talkSPORT, is also taking its place on a new national DAB digital radio multiplex serving parts of the UK, is launching on 15th March 2016 on the opening day of The Cheltenham Festival, broadcasting live from the event. The service joins seventeen other stations launching on or after 29th February 2016 - the big switch-on date for the second bundle of stations serving large areas of the UK. STOP PRESS All stations in the line-up yet to officially launch are broadcasting test transmissions. The bundle of stations, carried on the Sound Digital multiplex, will be broadcast on DAB digital radio using a combination of DAB and DAB+ formats and can be heard across major connurbations of England, with the initial exception of East Anglia, Cornwall and coastal parts of the South-East. Parts of North Devon are covered. The multiplex broadcasts across Central Scotland, parts of Northern Ireland and across South Wales and parts of North-East Wales. The coverage area includes parts of South-West Midlands including Herefordshire. If you're new to DAB and DAB+, but want to receive the new stations, check out our DAB and DAB+ Buyers' Guide for details of radio receivers and audio systems capable of tuning in to digital radio. As the coverage area of the new bundle of stations is smaller than the existing D1 commercial radio bundle, you may find you can no longer receive Planet Rock, Absolute Radio 80s and Premier Christian Radio. These three stations are being moved to their new home on the Sound Digital (SDL) multiplex, which covers about 73 percent of the UK adult population (including the areas listed above). This represents a reduction in UK coverage area compared to the D1 bundle, which presently covers more than 95 percent of the UK adult population. A relaunched talkRADIO, which originally landed on 1053 and 1089 mediumwave on Valentine's Day in 1995 before being transformed into the 24-hour sports brand talkSPORT in April 2012, makes a welcome return to the digital airwaves in March 2016. Virgin Radio also makes a comeback to the UK, with a serving of rock and pop music, joining established rock and metal brand Planet Rock, eighties pop classics Absolute Radio 80s, old skool & dance anthems Kisstory and pop and celebrity news station heat radio. Business and finance newcomer Share Radio also launches, with children's station Fun Kids finding a permanent home on national DAB. Fun Kids will use the DAB+ standard to broadcast and has a confirmed launch date of 29th February. New sister stations to soft adult contemporary station Magic - Mellow Magic and Magic Chilled - will also be broadcasting on DAB digital radio. Magic Chilled will broadcast in the newer DAB+ standard. No fewer than three Christian radio stations - UCB 2 (formerly UCB Inspirational), playing Christian music, launches alongside Premier Christian Radio and Premier's new station Premier Praise!. British Sikhs and Panjabi speakers are catered for by Panjab Radio, whilst a new British Muslim lifestyle, music and speech station Awesome Radio from Asian Sound is also included in the lineup. Sunrise Radio offers Asian music and speech programmes. Finally jazz, blues and soul station Jazz FM returns to national digital radio, expanding its London coverage to the majority of the UK, using the DAB+ standard. Sound Digital's technical plan is for services to reach more than 73 percent of UK adults (15+), 63 percent of major roads and an estimated 88 percent of vehicles on the UK road network, using more than 45 transmitters to provide indoor and outdoor coverage. How can I check if I can receive the new stations? The multiplex operator is broadcasting test transmissions on channel/block 11A for those stations yet to launch. 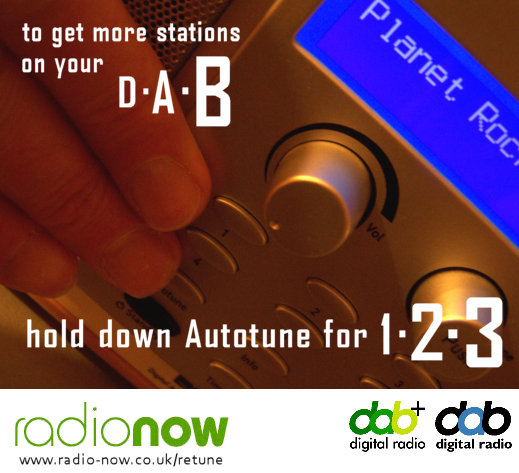 You'll need to retune your DAB radio now to see if you can hear the launched services on your DAB and DAB+ compatible receiver. If you can't hear audio when you tune to Jazz FM, Magic Chilled and Fun Kids, you will need to check if the software in your radio can be upgraded to receive DAB+ broadcasts. If you can't find any of the stations' names above in your station list, chances are your radio reception isn't strong enough to pick up the new stations, but read our advice to find out how you can improve your chances of picking up the new bundle of stations. If you've a Pure-branded DAB radio, check the Pure Upgrade website with your radio's serial number to hand, to see if you can upgrade to DAB+. Roberts Radio have user guides for all DAB radios - look for the DAB+ logo to see if yours can receive DAB+. Check on your DAB radio or on the box for a DAB+ logo or digital tick, to confirm you'll be able to hear Jazz FM, Magic Chilled and Fun Kids, which will be using the newer and more efficient DAB+ standard to broadcast. Many newer DAB radios manufactured in the last five years can receive DAB+. To receive DAB digital radio services, you need a type of radio designed to pick up digital broadcasts over the airwaves through its built-in aerial. We've links to good models on our pages, with a DAB Buyer's Guide, or scroll down the page for some quick links to both DAB and wi-fi receivers featuring DAB+. DAB and DAB+ Buyers' Guide, on this website.